Purdue Veterinary Technology Alumna's Workplace Really is a Zoo! 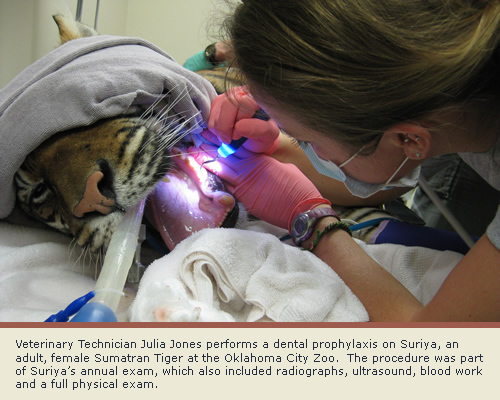 “Anesthesia for exams, lab work, administering treatments, and necropsy are some daily tasks,” explains Julia Jones (PU AS-VT ’11), when talking about a typical day on the job at the Oklahoma City Zoo where she works. Jones found the position in a job listing on the Association of Zoos and Aquariums (AZA) website, after completing a one year internship as a diagnostic intern at the Wildlife Center of Virginia. She was hired by the Zoo in February.